Runners escorted a torch-bearer on Alii Drive on the Troy Barboza Torch Run. The torch run raises funds for Special Olympics which officer Barboza was a supporter of. Chopper One taking off to search for the downed Piper Warrior. Later in the day things got busy as a small plane crashed in South Kona. Fast fading sunlight prevented rescue helicopters (including Chopper One from a previous blog post) from locating the victims. It also prevented me from getting any good photos of the rescue mission. The US Coast Guard used their high tech equipment to locate and rescue the crash victims. 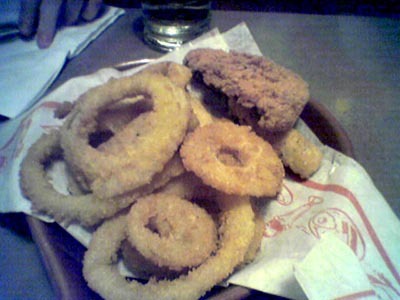 And despite reading Fast Food Nation by Eric Schlosser I went to Denny’s after work with Andrea and Karen to munch on a late night of deep fried American junk food: onion rings, mozzarella sticks and chicken strips. Can a coronary be far behind? Karen read the book, Andrea is currently reading it and I listened to the audio book so I guess we have no excuse, we had been warned. Okay, the food wasn’t that fast as the service wasn’t too good. But working that late-shift can’t be much fun for workers.